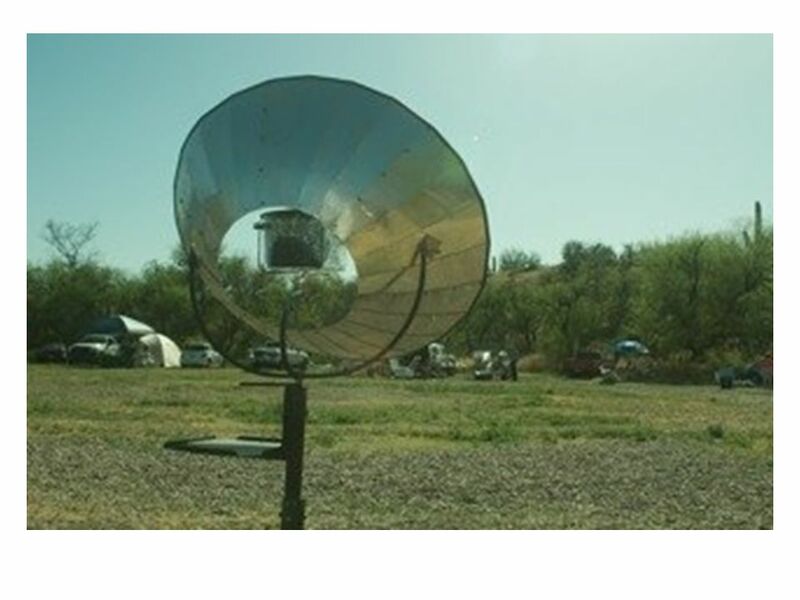 This is a truncated slideshow taken from my personal history of exploring the world of solar cooking. It is one of my favorite pass-times, although doing. 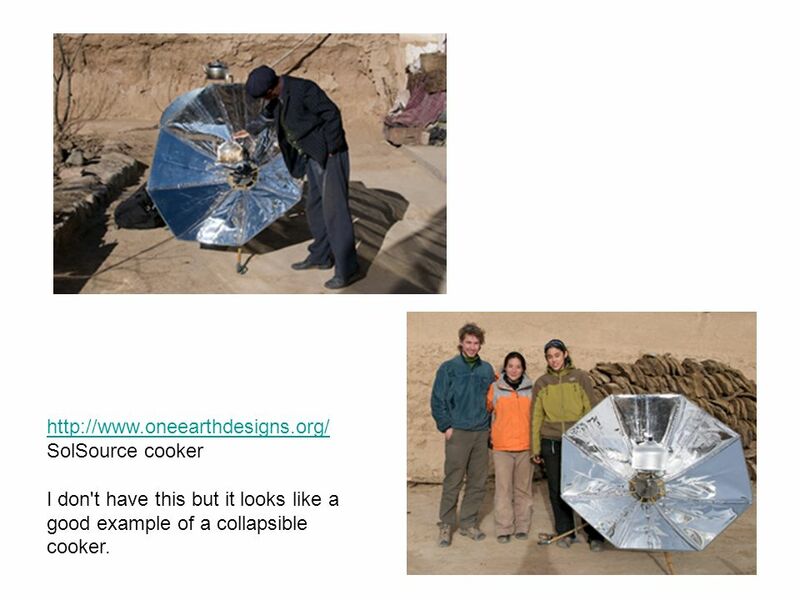 1 This is a truncated slideshow taken from my personal history of exploring the world of solar cooking. It is one of my favorite pass-times, although doing it requires the felicitous appearance of the sun here in Minnesota, the land of "variety weather." 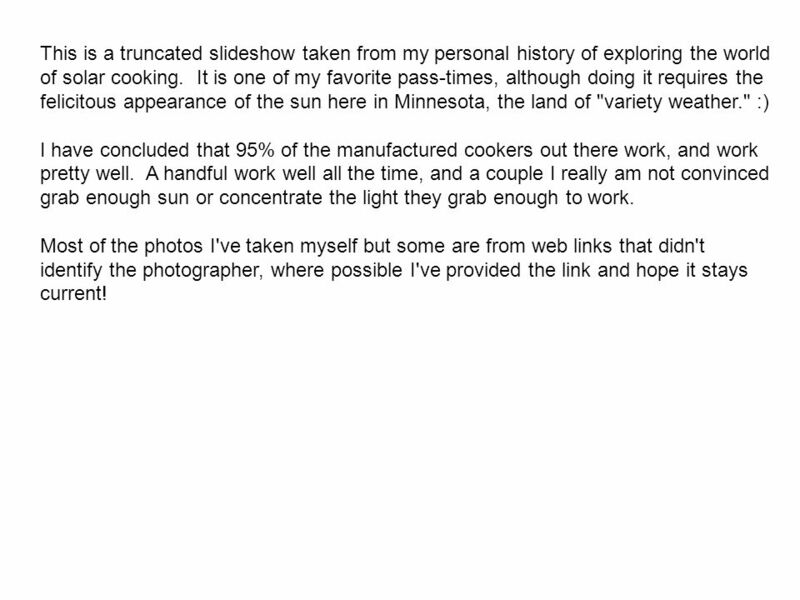 :) I have concluded that 95% of the manufactured cookers out there work, and work pretty well. A handful work well all the time, and a couple I really am not convinced grab enough sun or concentrate the light they grab enough to work. Most of the photos I've taken myself but some are from web links that didn't identify the photographer, where possible I've provided the link and hope it stays current! 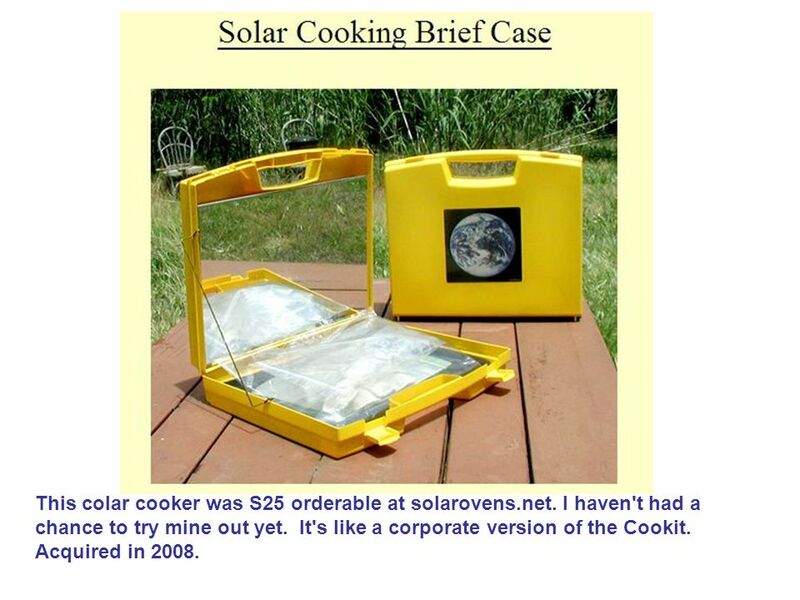 3 I started collecting and using many commercially available solar cookers. Here is an SK-14, built in Germany. It must be "refocused" it every ten or twenty minutes. 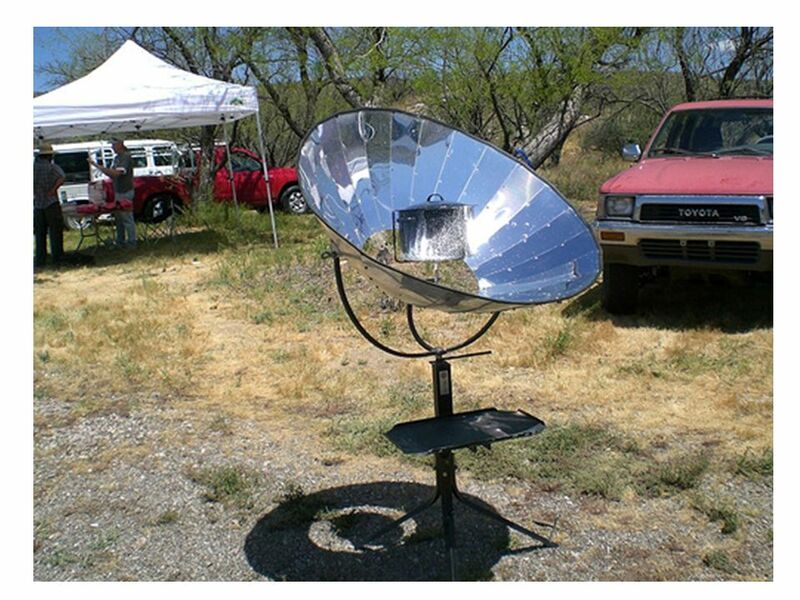 But it can be used year round since it concentrates sunlight so effectively, even the low sun of a Minnesota winter. Acquired 2006. Plantains!!! A dual-position panel cooker. 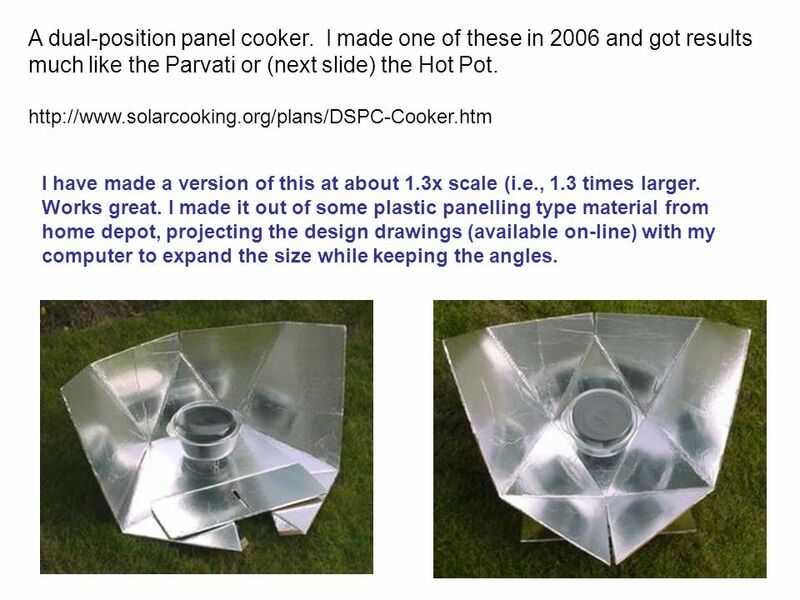 I made one of these in 2006 and got results much like the Parvati or (next slide) the Hot Pot. I have made a version of this at about 1.3x scale (i.e., 1.3 times larger. Works great. I made it out of some plastic panelling type material from home depot, projecting the design drawings (available on-line) with my computer to expand the size while keeping the angles. 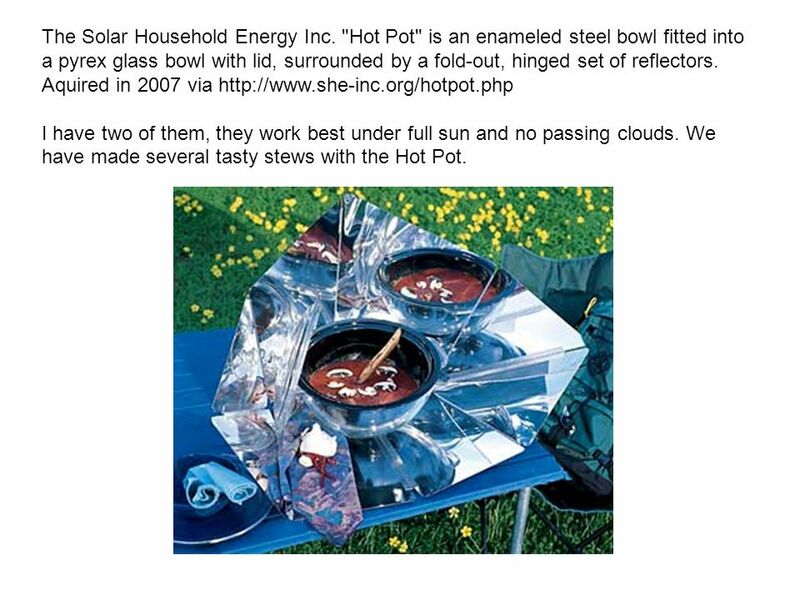 The Solar Household Energy Inc. "Hot Pot" is an enameled steel bowl fitted into a pyrex glass bowl with lid, surrounded by a fold-out, hinged set of reflectors. 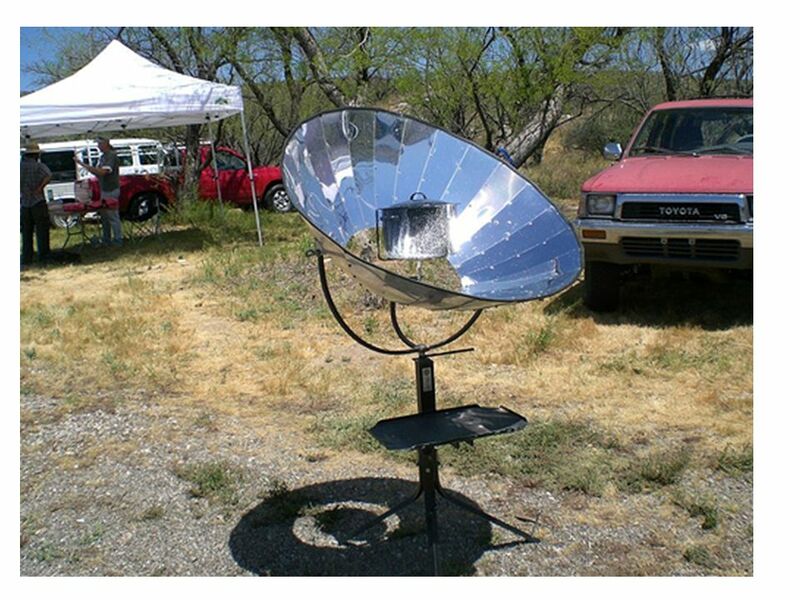 Aquired in 2007 via I have two of them, they work best under full sun and no passing clouds. We have made several tasty stews with the Hot Pot. 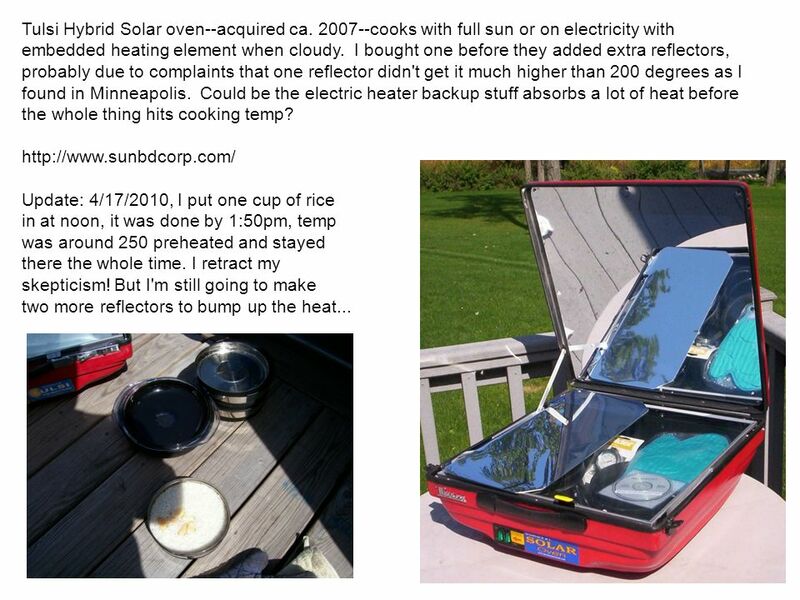 9 sunoven.com for more info. It sells for an average of $250 I bought this in A real "work horse", gets up to 300 degrees consistently and stays there even after adding food. 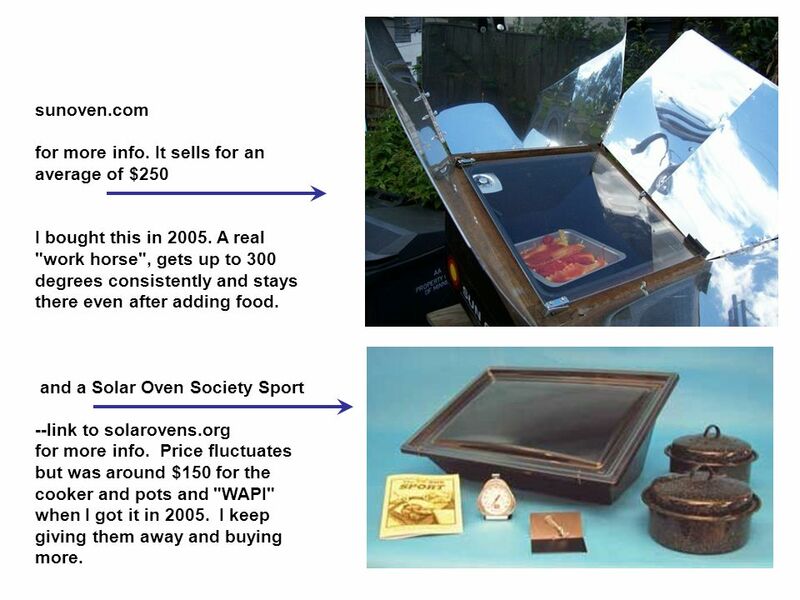 and a Solar Oven Society Sport --link to solarovens.org for more info. Price fluctuates but was around $150 for the cooker and pots and "WAPI" when I got it in I keep giving them away and buying more. ...which quotes $399 plus taxes and shipping. 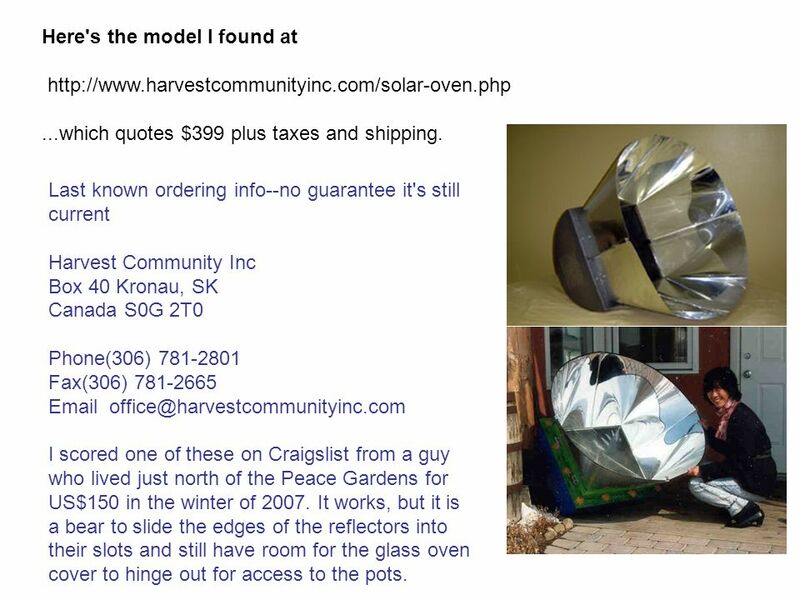 Last known ordering info--no guarantee it's still current Harvest Community Inc Box 40 Kronau, SK Canada S0G 2T0 Phone(306) Fax(306) I scored one of these on Craigslist from a guy who lived just north of the Peace Gardens for US$150 in the winter of It works, but it is a bear to slide the edges of the reflectors into their slots and still have room for the glass oven cover to hinge out for access to the pots. 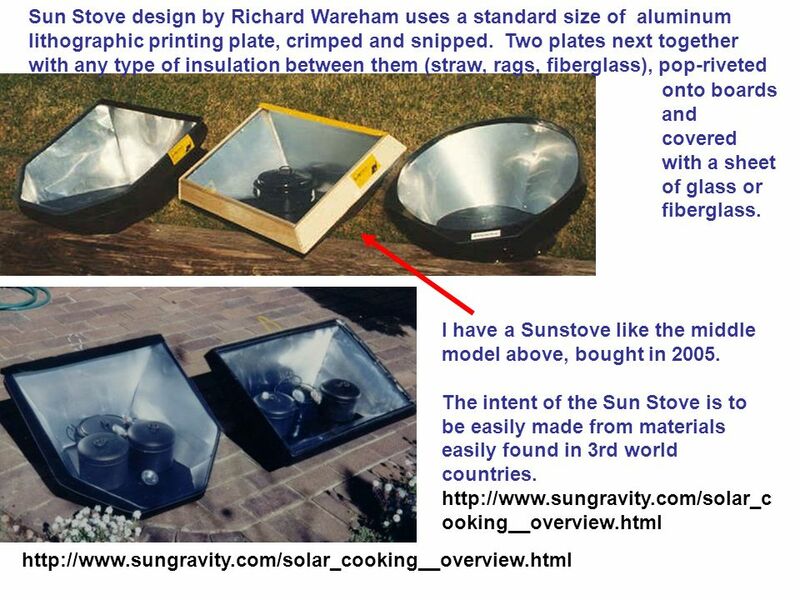 11 Sun Stove design by Richard Wareham uses a standard size of aluminum lithographic printing plate, crimped and snipped. Two plates next together with any type of insulation between them (straw, rags, fiberglass), pop-riveted onto boards and covered with a sheet of glass or fiberglass. I have a Sunstove like the middle model above, bought in 2005. 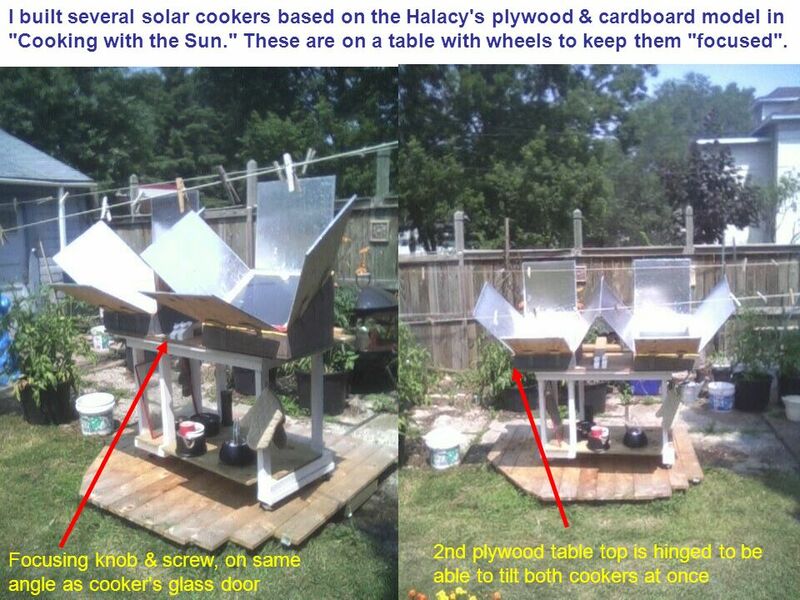 The intent of the Sun Stove is to be easily made from materials easily found in 3rd world countries. 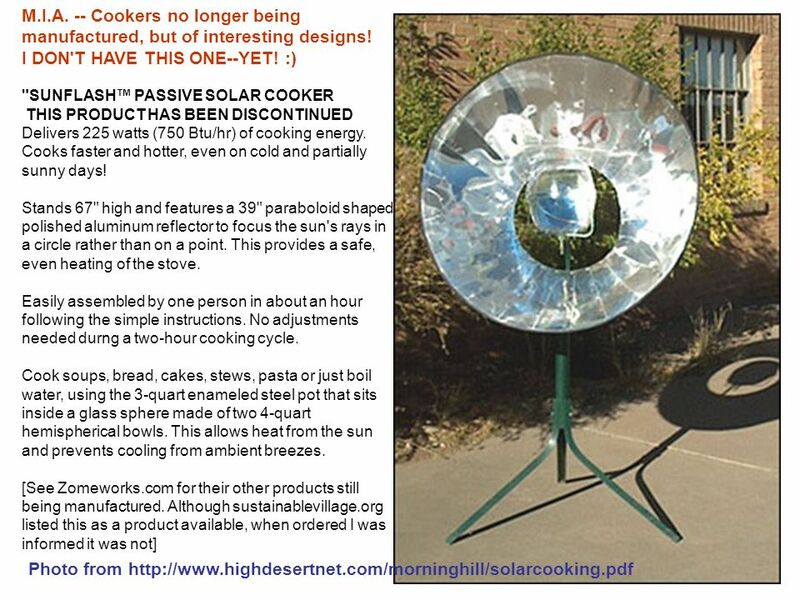 This colar cooker was S25 orderable at solarovens.net. I haven't had a chance to try mine out yet. It's like a corporate version of the Cookit. Acquired in 2008. 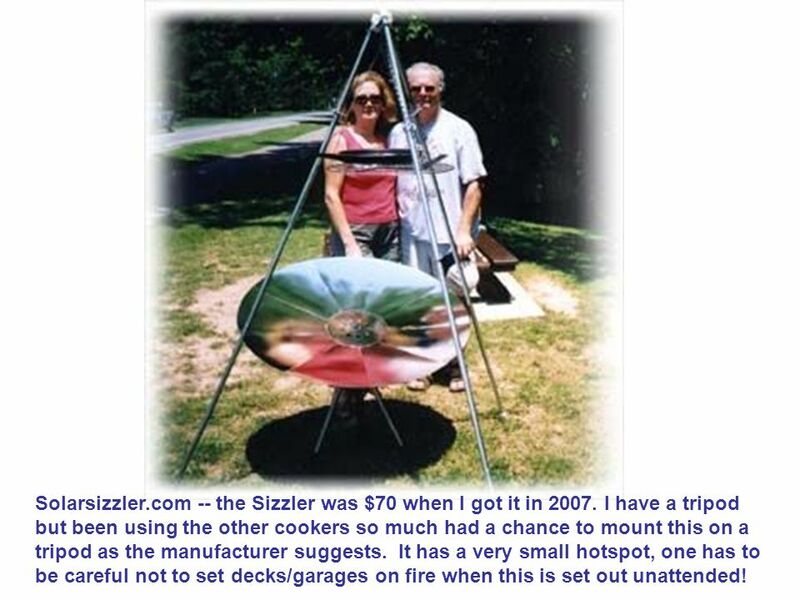 Solarsizzler.com -- the Sizzler was $70 when I got it in I have a tripod but been using the other cookers so much had a chance to mount this on a tripod as the manufacturer suggests. It has a very small hotspot, one has to be careful not to set decks/garages on fire when this is set out unattended! 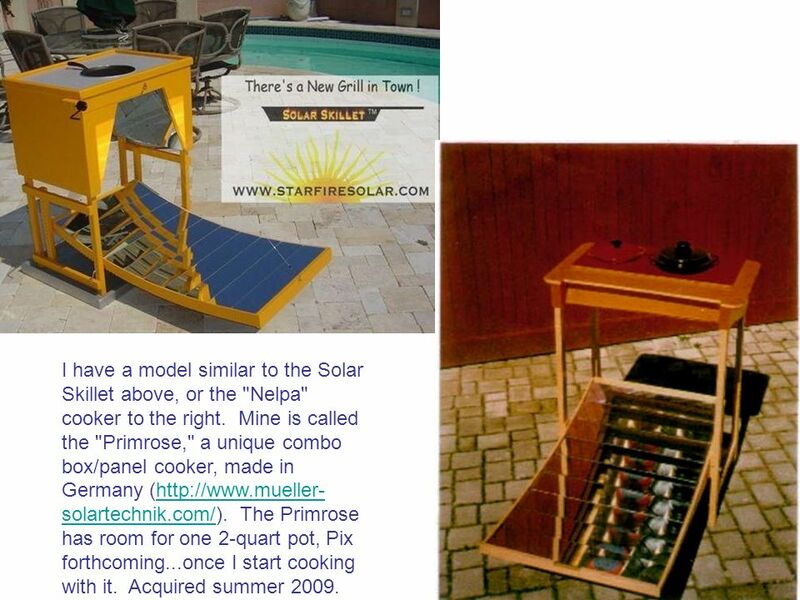 14 I have a model similar to the Solar Skillet above, or the "Nelpa" cooker to the right. Mine is called the "Primrose," a unique combo box/panel cooker, made in Germany ( The Primrose has room for one 2-quart pot, Pix forthcoming...once I start cooking with it. Acquired summer 2009. 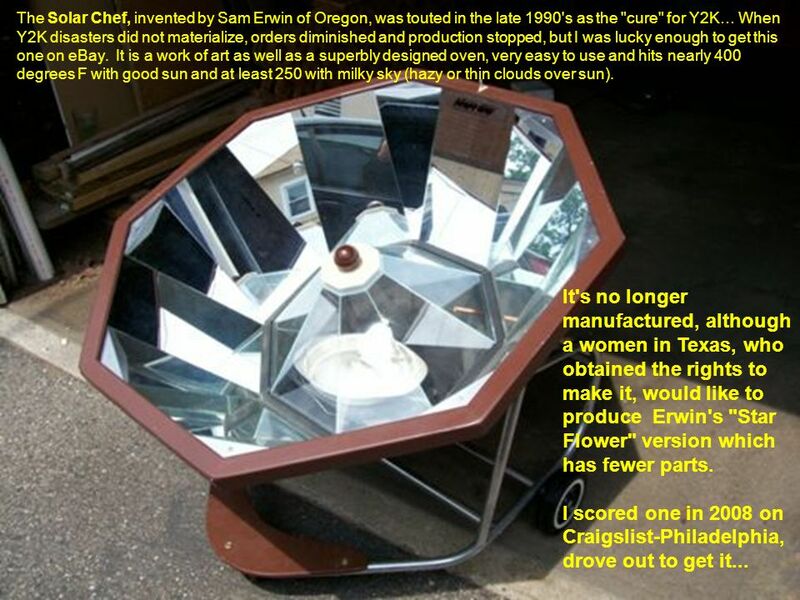 19 Andersen Solar Cooker--an off-shoot product of Andersen Manufacturing in Idaho Falls, ID. 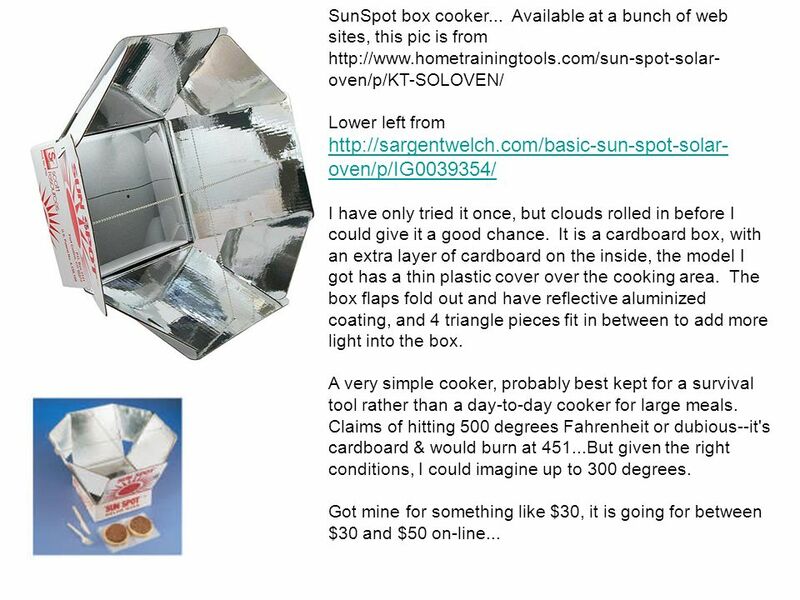 About $500 for the cooker, and another $100 or so for accessories when I bought it winter The focal point is thrown onto the side of the cooking vessel, presenting a unique problem of the potential scorching solids on the side of a pot or soup solids floating to the top and the focal point side. A rotisserie motor configuration solves that. 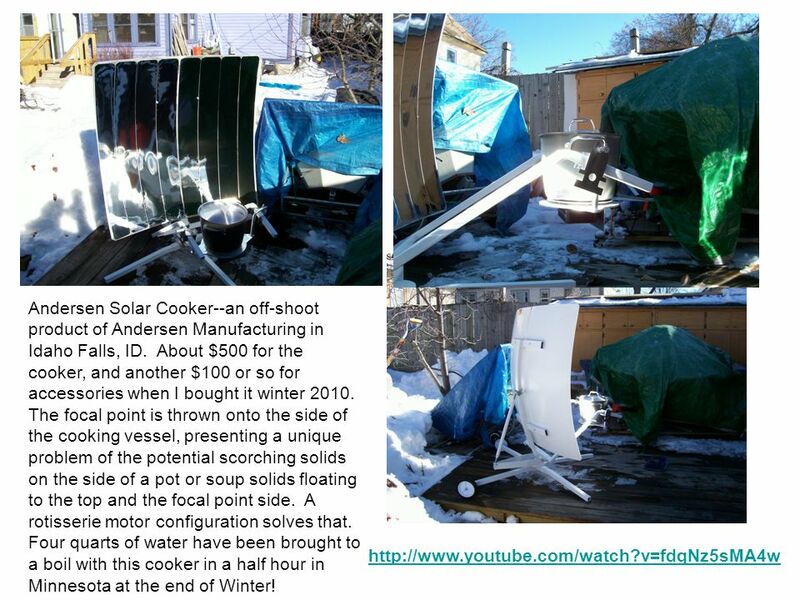 Four quarts of water have been brought to a boil with this cooker in a half hour in Minnesota at the end of Winter! 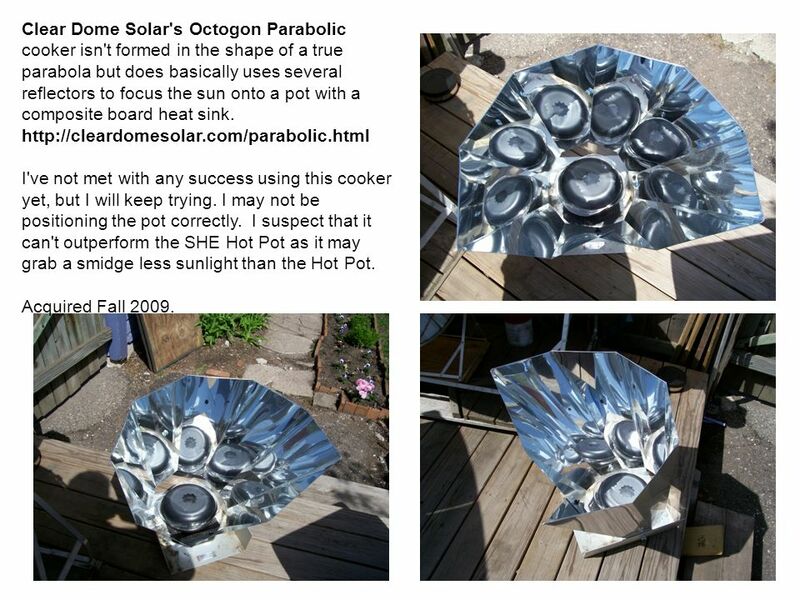 20 Clear Dome Solar's Octogon Parabolic cooker isn't formed in the shape of a true parabola but does basically uses several reflectors to focus the sun onto a pot with a composite board heat sink. I've not met with any success using this cooker yet, but I will keep trying. I may not be positioning the pot correctly. I suspect that it can't outperform the SHE Hot Pot as it may grab a smidge less sunlight than the Hot Pot. Acquired Fall 2009. 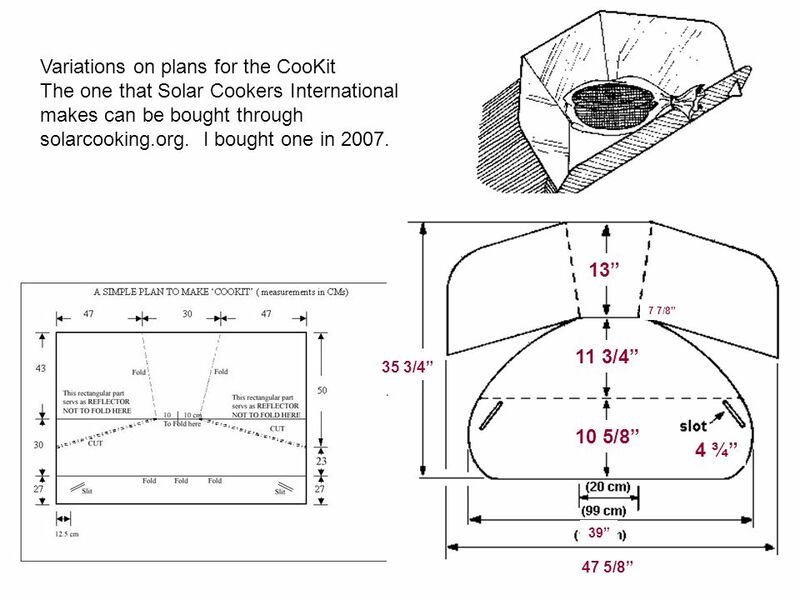 25 SolSource cooker I don't have this but it looks like a good example of a collapsible cooker. 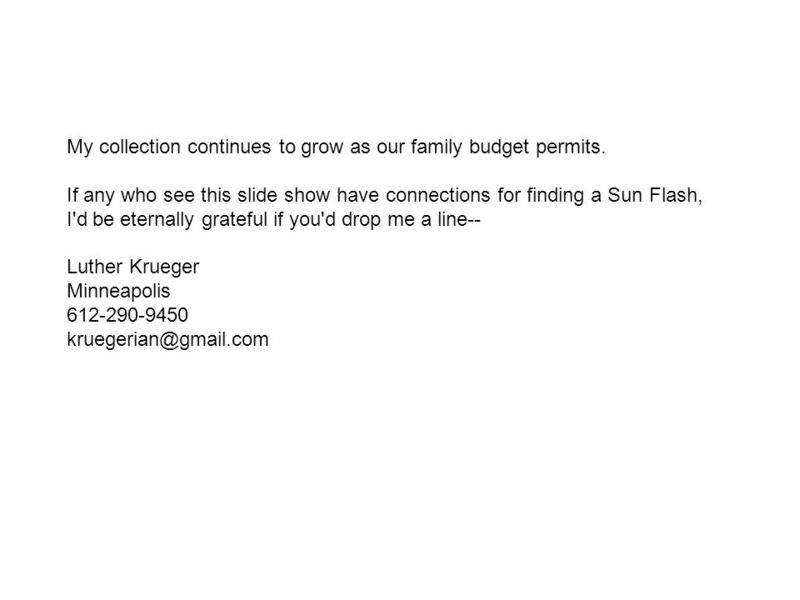 26 My collection continues to grow as our family budget permits. 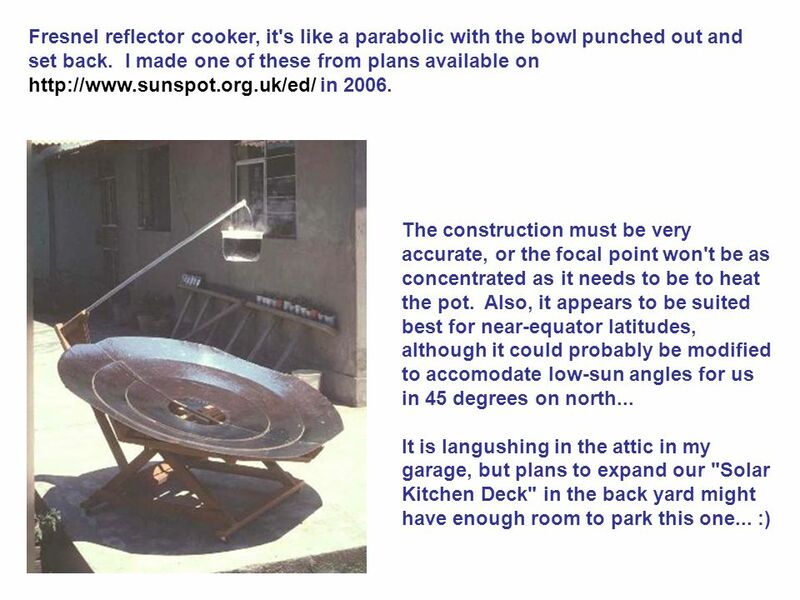 Download ppt "This is a truncated slideshow taken from my personal history of exploring the world of solar cooking. It is one of my favorite pass-times, although doing." Specific Heat. What are the building blocks? This concept does not involve building or breaking down of molecules but might involve a mixture of elements. Building a Better Future Stretch Building Code October 15, 2009. Biosphere 3: Energy Look at how MANY panels there are for just those few small living spaces! Tahoma Jr. High 8th Grade Science Maple Valley, WA. By Matt Wilson, Meike Schleiff, Ashley Burba, Scott Rowland, Eric Davidson, and Kimberly Blanton SENS 100 Spring 2008. WHY TO USE ONLY HIDDEN ACRES NURSERY TISSUE CULTURED RED FOUNTAIN GRASS PREDICTABLE GROWTH IN COOL TEMPS AS LOW AS 40F. BECAUSE OF TISSUE CULTURE TURNING. Part One: Seed Germination If you are doing a project that involves plants, you will have to successfully pass this mini-course. Follow the directions. PROJECT BY : RITA SAMSSEME, GRADE 8. 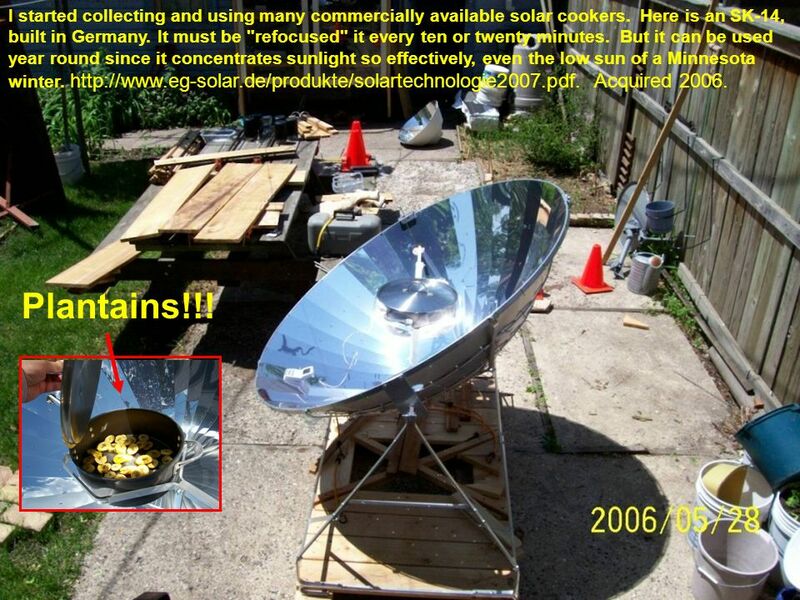 COOKING USING SUNLIGHT. Solar Cooker Mrs. McGuffey’s Science Class 2 nd Semester Project. Cut off the top off an aluminum can. Exploration Warning: Be very careful not to cut yourself on the sharp edges of the can. 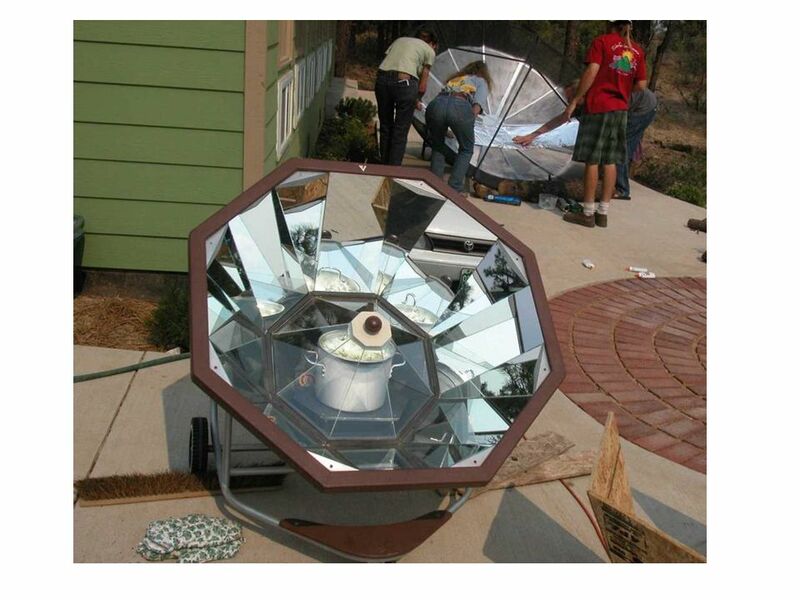 Solar Oven by Cho Ei Seona Seol. We prepared following items One sheet of cardboard to make the lid One small roll of aluminum foil. One can of flat-black. Misc. (2) Misc. (1) Heat Energy (2) Heat Energy (1) States of Matter 50 40 30 20 10 20 30 40 50 10 20 30 40 50 10 20 30 40 50 10 20 30 40 50.